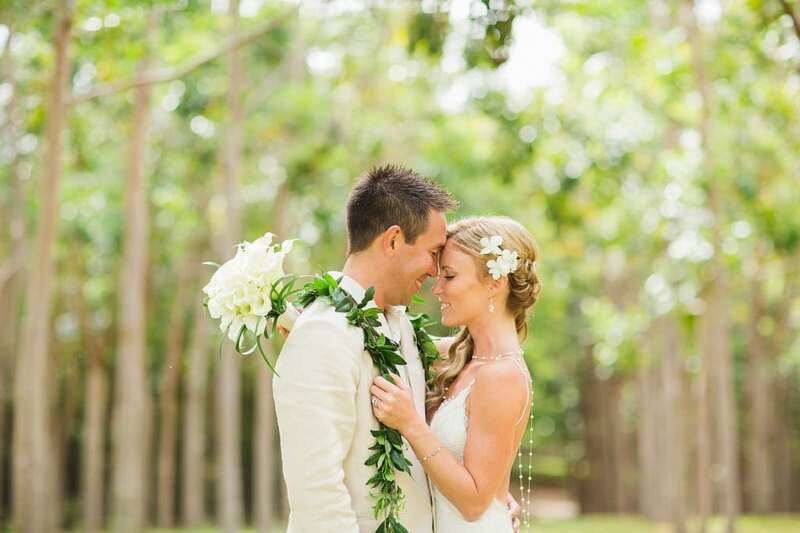 As a destination wedding venue it’s hard to beat Na ‘Āina Kai Botanical Gardens. 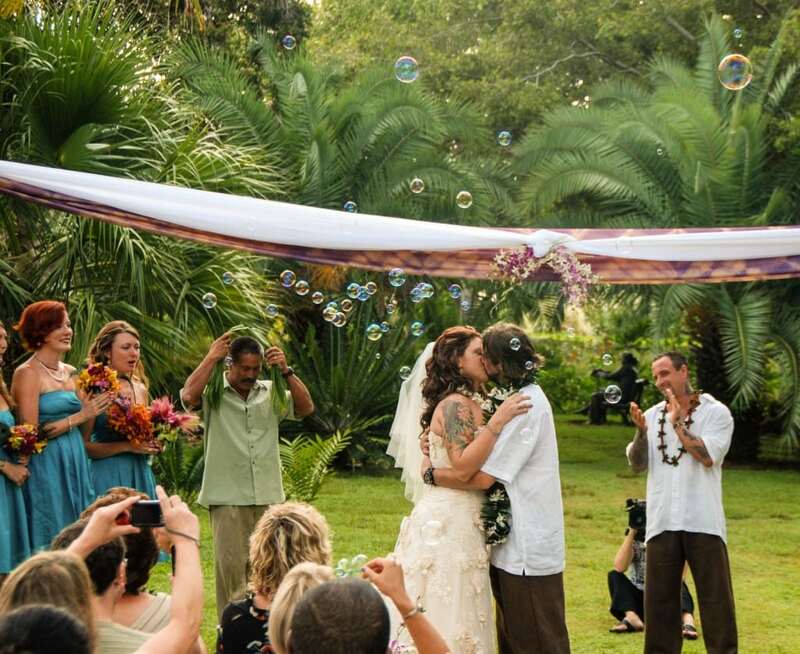 It’s not just one venue but a myriad of unique locations, from a small, intimate setting in a tropical forest to an ocean-bluff “Residence” to the Kaluakai Beach meadow and more. Once a private estate, the bountiful gardens of Na ‘Āina Kai are now open to the public for special occasions. Who could ask for a lovelier backdrop than these gardens, where artistic creativity goes hand-in-hand with nature. 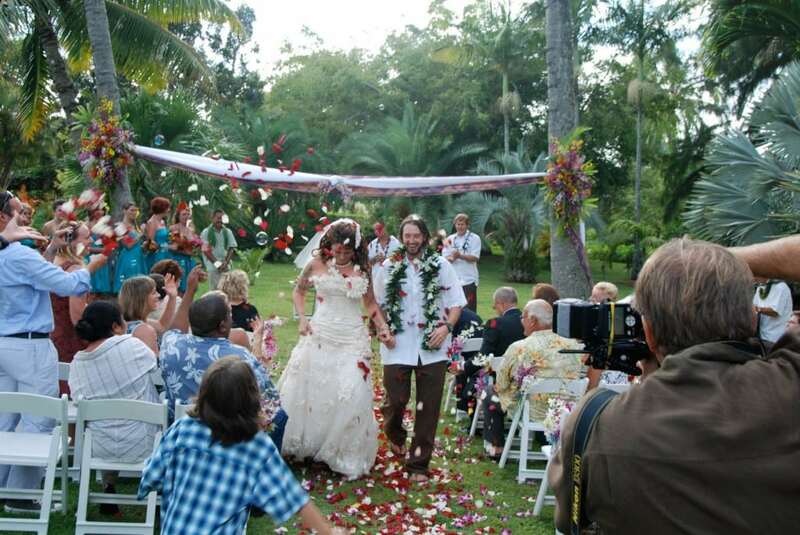 Whether your wedding is for 2 or 150, we can accomodate you and meet your needs. 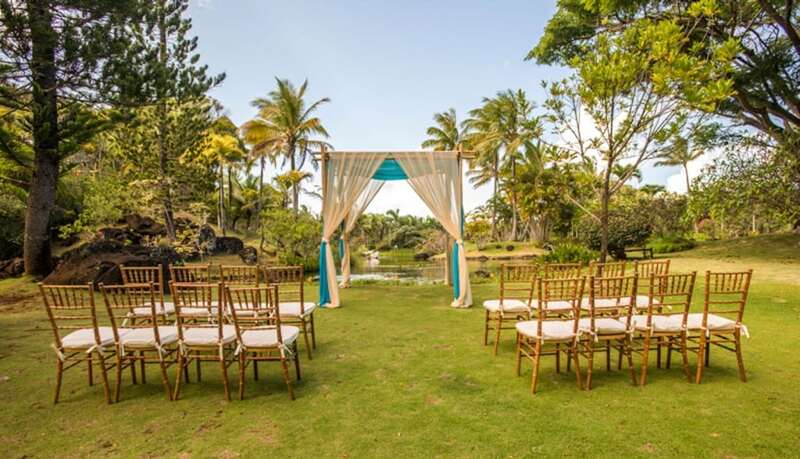 Let Na ‘Āina Kai be your private gardens for a memorable day or an evening. Should you choose our Gardens as the site for your wedding, you will be contributing to the efforts of our not-for-profit foundation to maintain these lovely surroundings for the future. 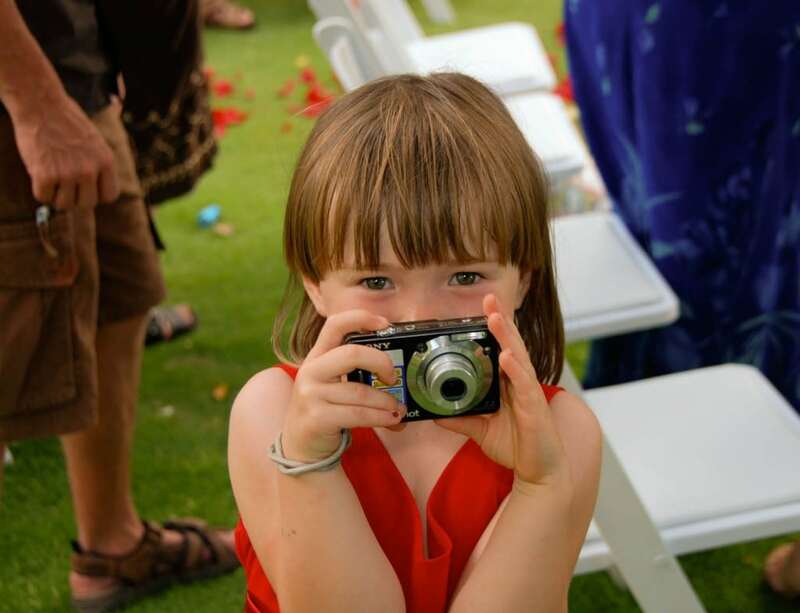 With multiple venues to chose from, it’s sure to leave a lasting impression on all who attend. 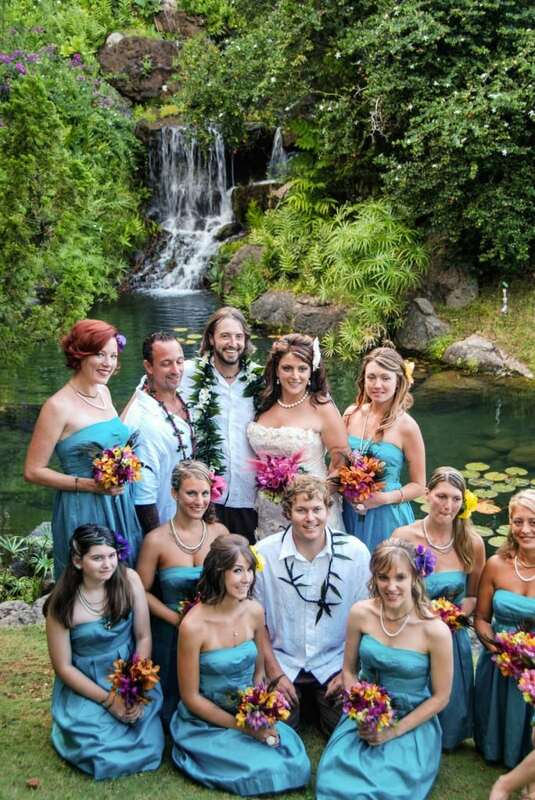 At Na ‘Āina Kai you will find exquisite venues for your special occasion. 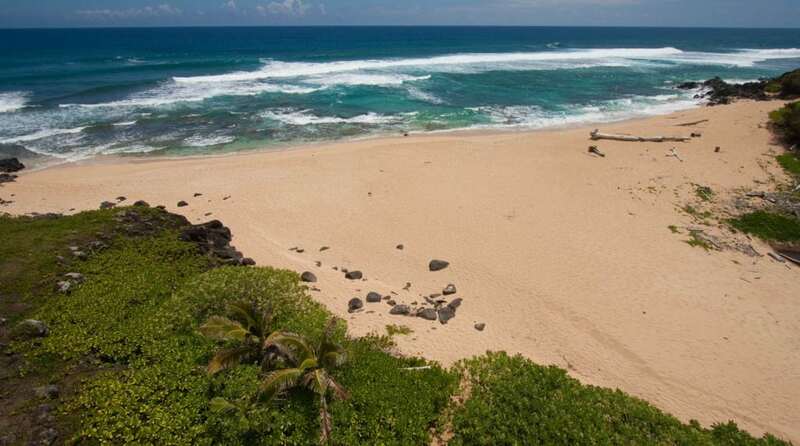 Solitude and unparalleled tropical beauty are the hallmarks of each enchanting locale. Surrounded by vast acreage and enhanced by an abundance of botanical wonders, the sites we offer have been selected for their mood setting ambiance, utmost privacy and ease of access by caterers and other service providers. These rare, sought after attributes promise to provide you and your guests with an incomparable, intimate experience in nature’s embrace. Extend the experience of your special event to the out-of-doors. 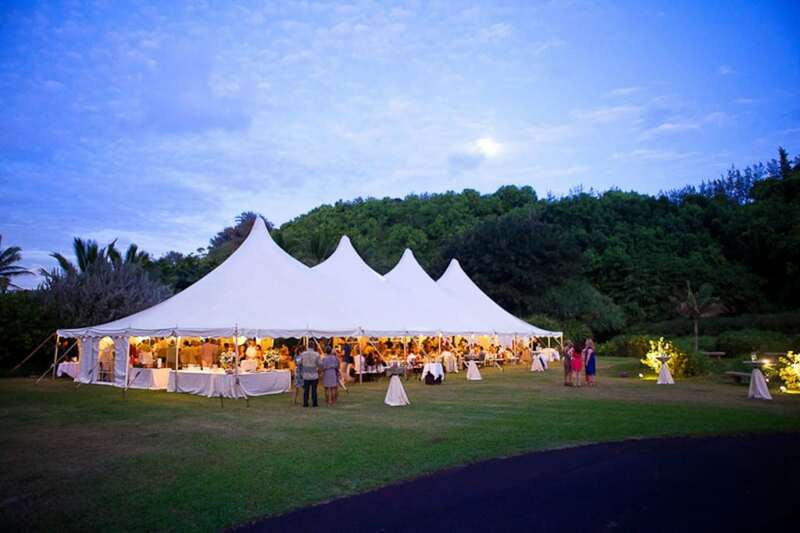 Several of our loveliest areas are perfectly suited for tents should you desire a covered venue. With a number of venues in the headings below, there’s sure to be one to suit your needs. Click on the venue heading to learn more. 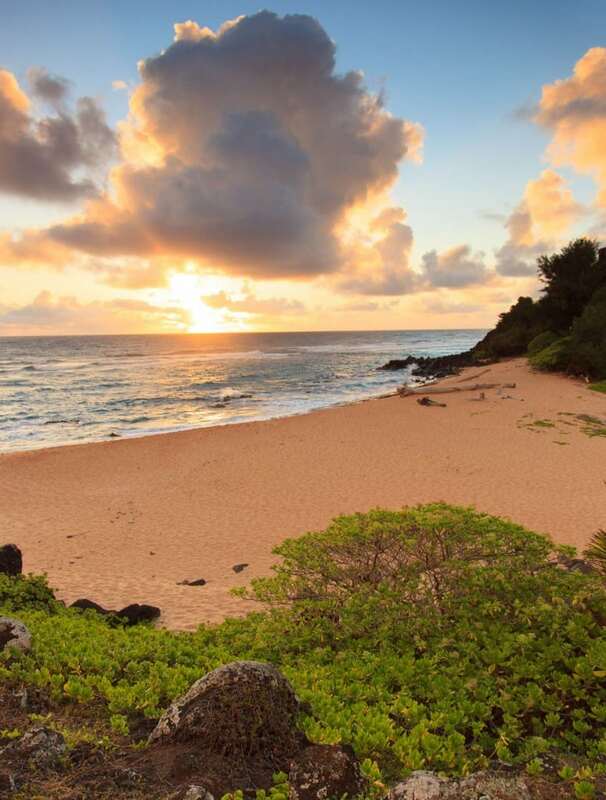 Few event sites are lovelier than those tucked along the wild Pacific shore of Na ‘Āina Kai, just beyond the garden’s tropical forest canyon. 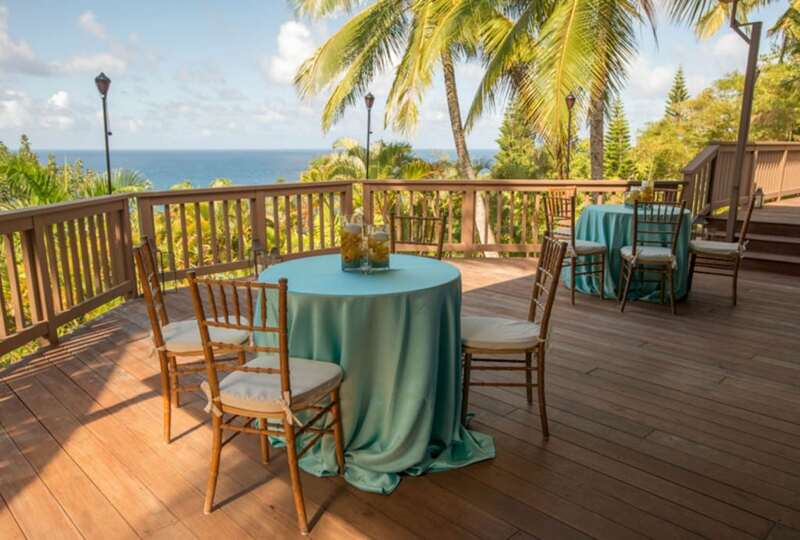 Our Seaside venue provides an oceanfront setting composed of three distinct, adjacent areas that harmonize to provide a diversified and spacious locale for your private gathering of up to 150 guests. The Seaside venue comes complete with spotless and spacious restroom facilities and electrical power to handle the needs of your caterer, entertainers and lighting vendors. Please click on the orange tabs below for more information and click on the thumbnails below to expand. 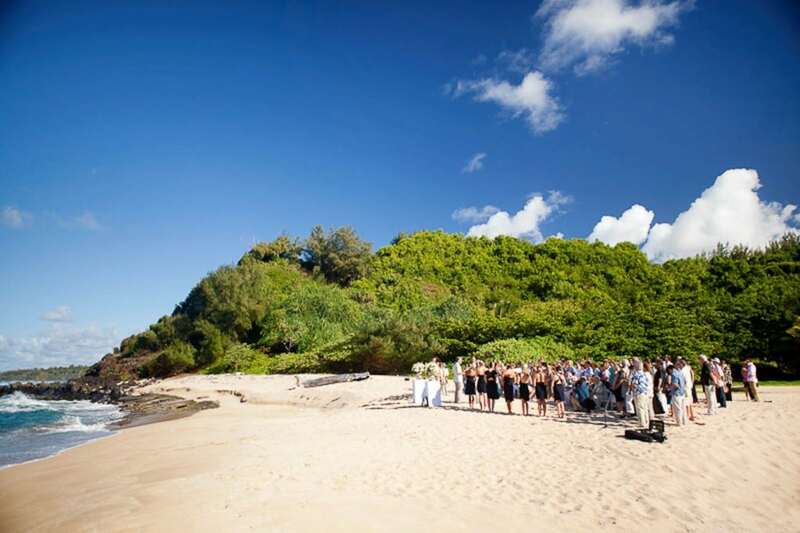 This gorgeous beach provides a stunning backdrop for a memorable wedding. Easy access and rest rooms close by make this a great location. White sand goes well with wedding fashion. This sweeping area with manicured lawn and tropical vegetation encompasses the largest sector of our Seaside venue. 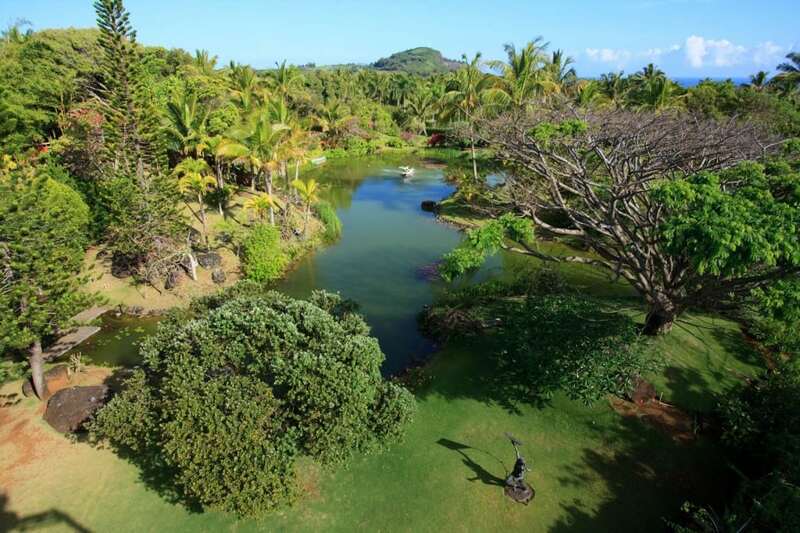 A level site with breathtaking ocean views, Lotus Meadow borders tranquil Makai Marsh, home to native waterfowl and an abundance of wetland plants. A boardwalk meanders from meadow to marsh, providing a means for guests to stroll and take in the beauty that surrounds them. 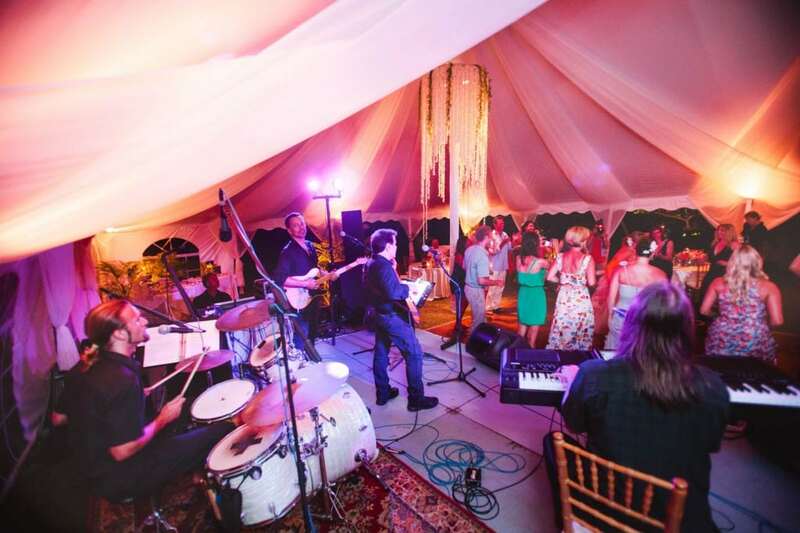 Lotus Meadow easily accommodates several tents for large events such as reception dinners, concerts and performances. The Meadow is literally steps away from the beach. Live music is welcome here. A Hawaiian net fisherman in bronze overlooks the festivities. There's room at the Makai Meadow for any size tent. 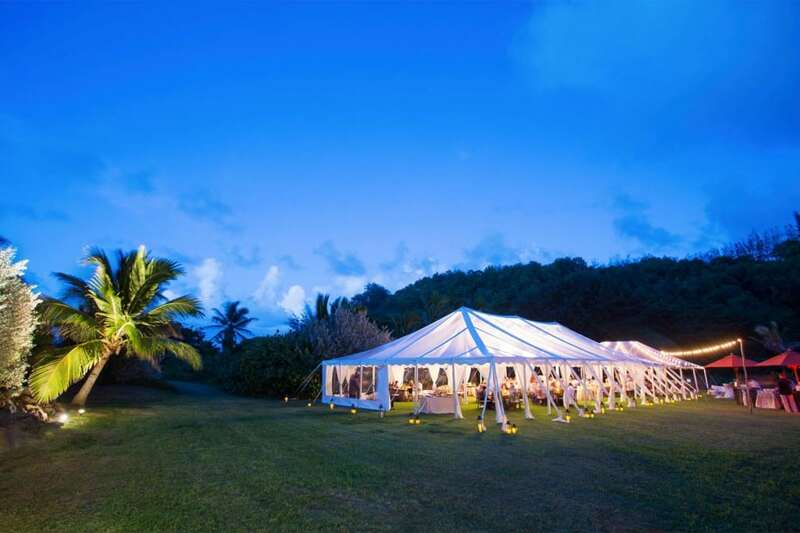 Just steps away from Lotus Meadow, this round, grassy site is the most intimate of our oceanfront venues. It is the gateway to our white sand beach and provides an irresistible locale for vow exchanges, cocktail receptions or simply a welcoming place of repose to soak up the soothing sound of waves upon the shore. This venue is literally steps from the beach. A cool canopy, hills and valleys, brooks and springs, and a bounty of woodland flora and fauna make the Hardwood Forest the most diverse venue within Na ‘Āina Kai. Pulsating with life, and enveloped with earthy fragrances, this rich woodland teems with surprises around every bend, alongside every stream, and underfoot every step of the way.Few weddings take place in an area as richly endowed as the Hardwood Forest at Na ‘Āina Kai. 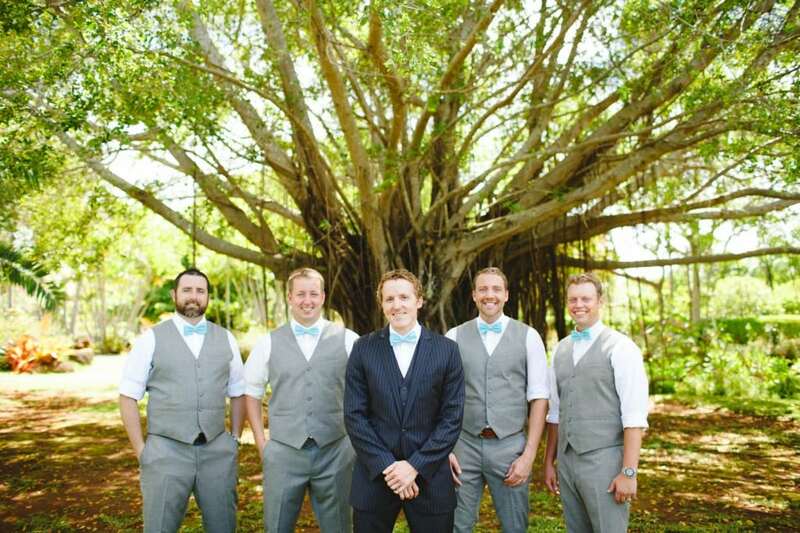 This cool, tropical canopy with its verdant ambiance, foretells a storybook life for the bride and groom. 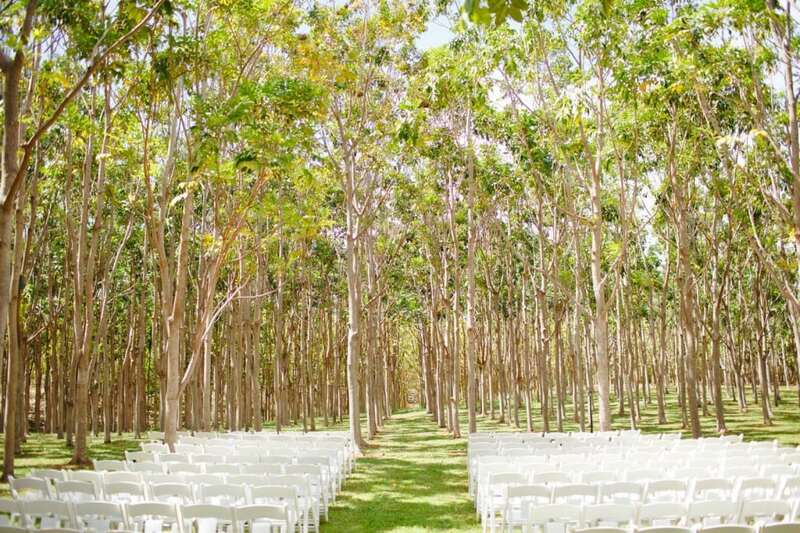 For a truly unique wedding venue, consider exchanging vows among the lovely hardwood trees that inhabit 123 acres of Na ‘Āina Kai. Our plantation boasts 23 species of hardwood trees including teak, mahogany, rosewood and zebrawood, just to name a few. Shuttles are used to bring your guests to the garden areas. 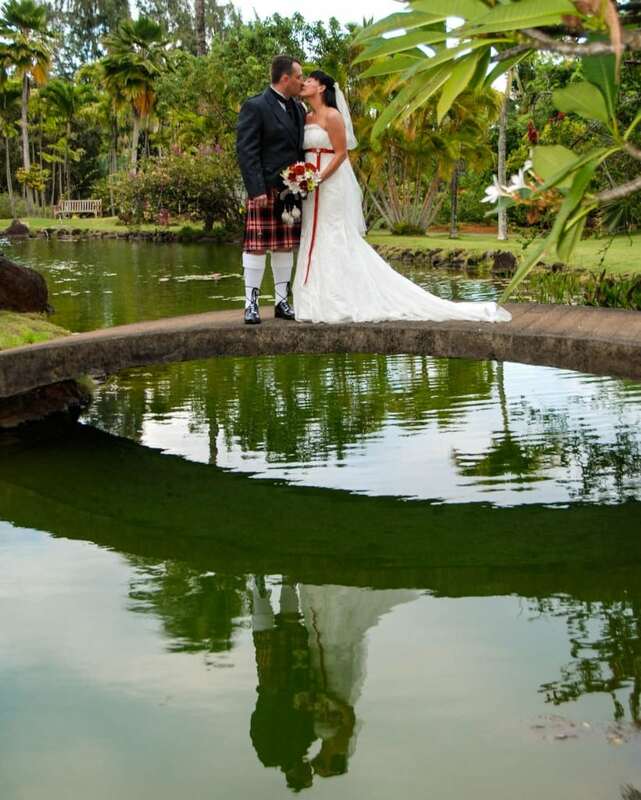 Grandeur and tranquility coexist in these most formal of venues within Na ‘Āina Kai. 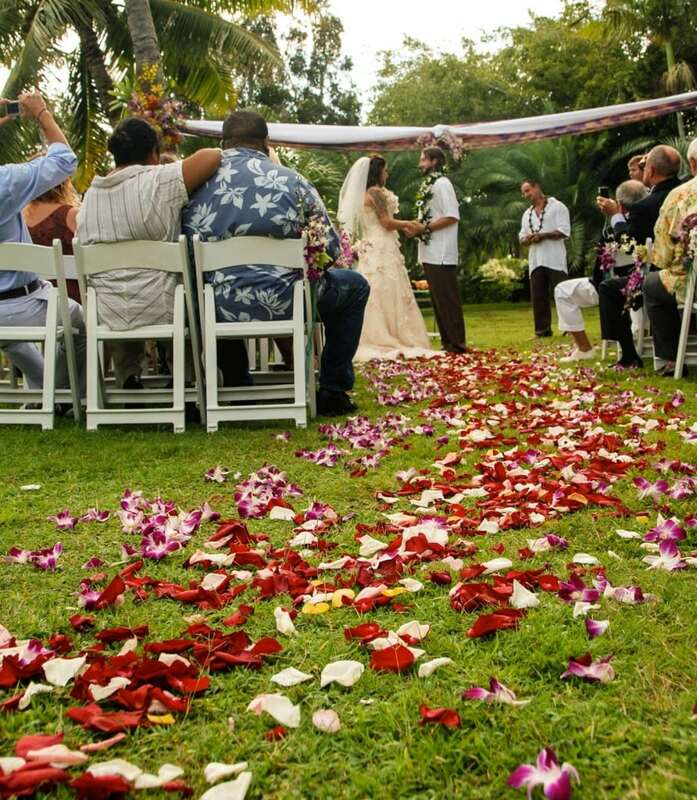 We offer several sites alongside Ka’ula Lagoon and near the Poinciana Maze for romantic wedding ceremonies and photos, cocktail receptions, artist workshops and a host of special open-air occasions. A picturesque waterfall cascades into this peaceful aquatic habitat — home to iridescent koi, native moorhens and water lilies — and creates a backdrop of unrivaled beauty for your special event. Several sites near the lagoon are suitable for ceremonies, and all provide lovely areas for strolling and contemplation. 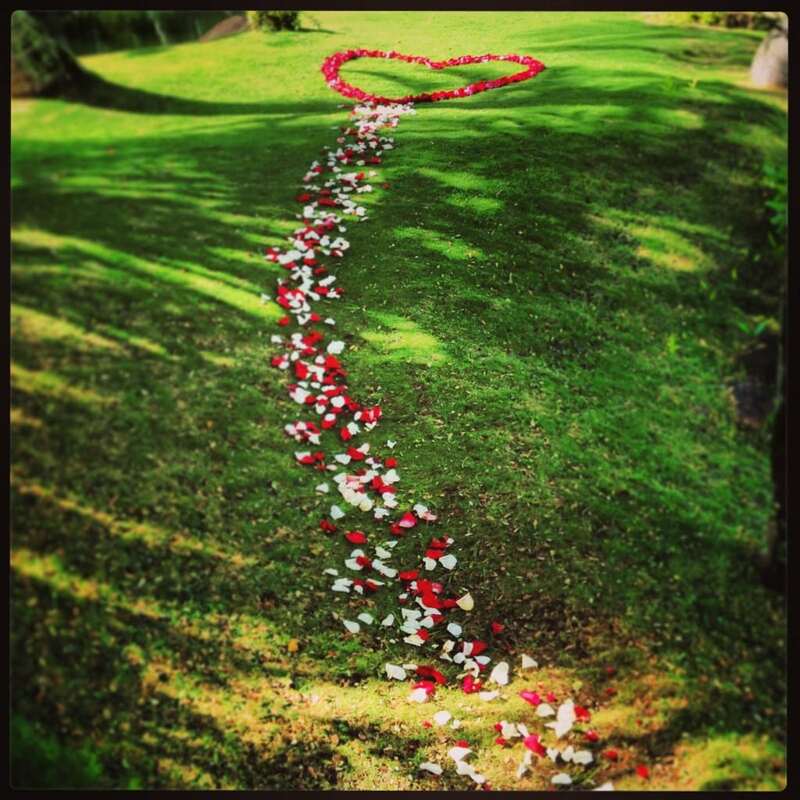 The ambiance alongside Ka‘ula Lagoon and throughout our Gardens speaks of love and romance. 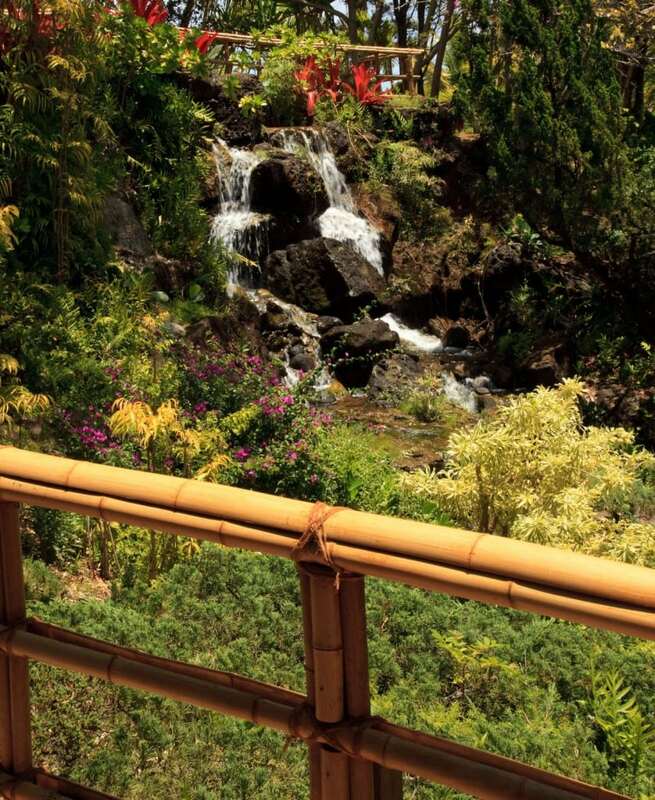 Perhaps you will make your wedding dreams come true by gracefully descending the stairs from our Japanese Teahouse, alongside the melodic waterfall, through arbor vines and glorious blossoms, to reach your ceremony site at the edge of the lagoon. 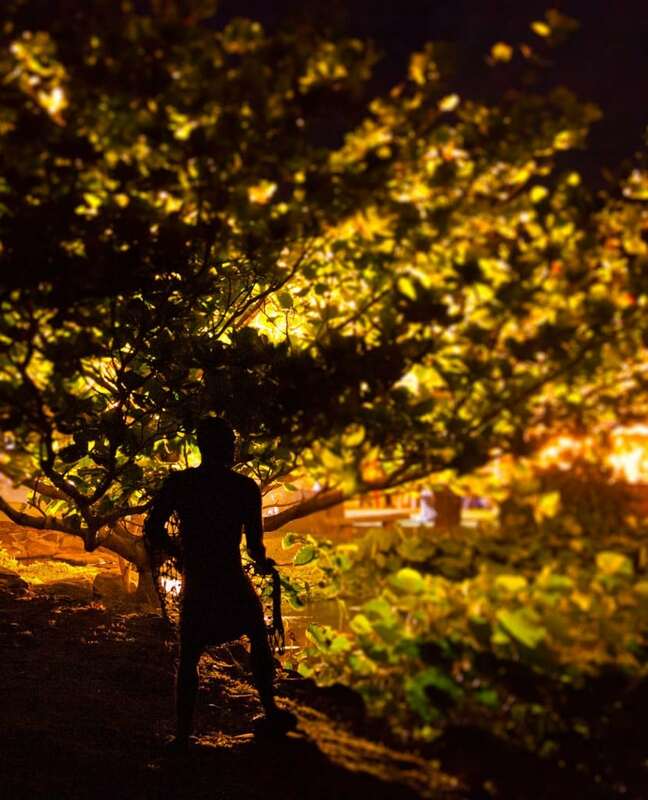 For an especially intimate ceremony, cross the arched bridge to Hula Island, which is graced by a life-sized bronze sculpture of a male hula dancer. 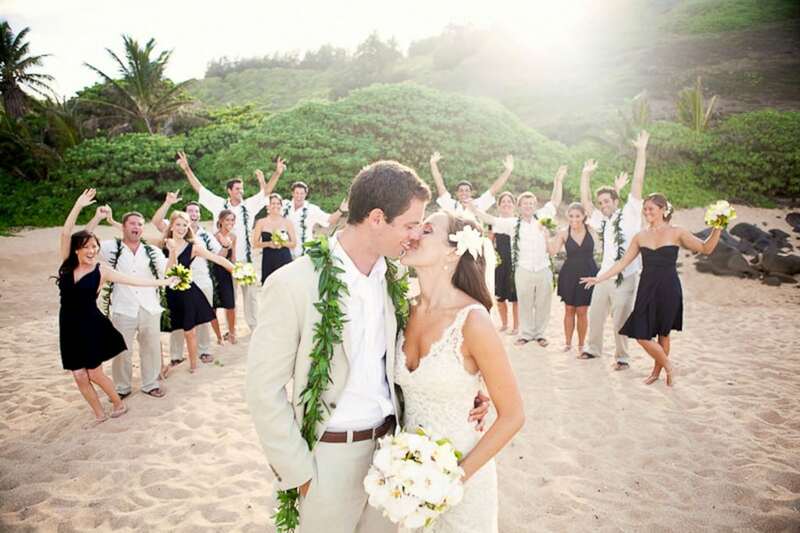 Once you have pledged your love, pose for wedding photos on the bridge or at the lagoon’s edge. Several locations surrounding the magnificent Poinciana Maze are ideal for open-air events. Guests will enjoy exploring the maze and surrounding garden areas where surprising art treasures abound. 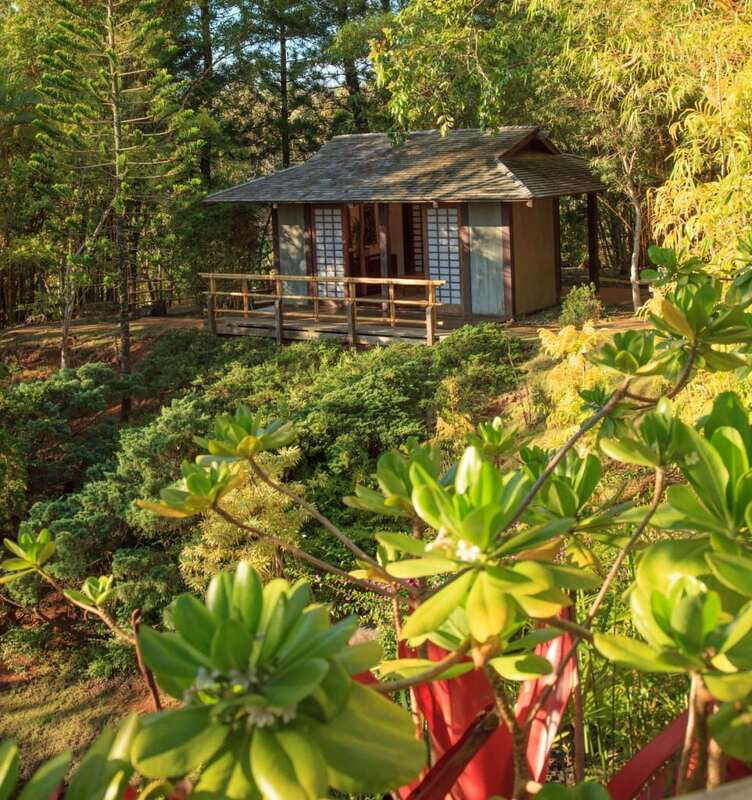 Nestled on a hillside overlooking the waterfall, our Japanese Teahouse is surrounded by Asian-inspired bonsai, an allspice tree with its spicy berries, and various species of bamboo. This tranquil locale, exquisitely appointed inside, is available on a limited basis. It is ideal for an intimate wedding or tea ceremony. 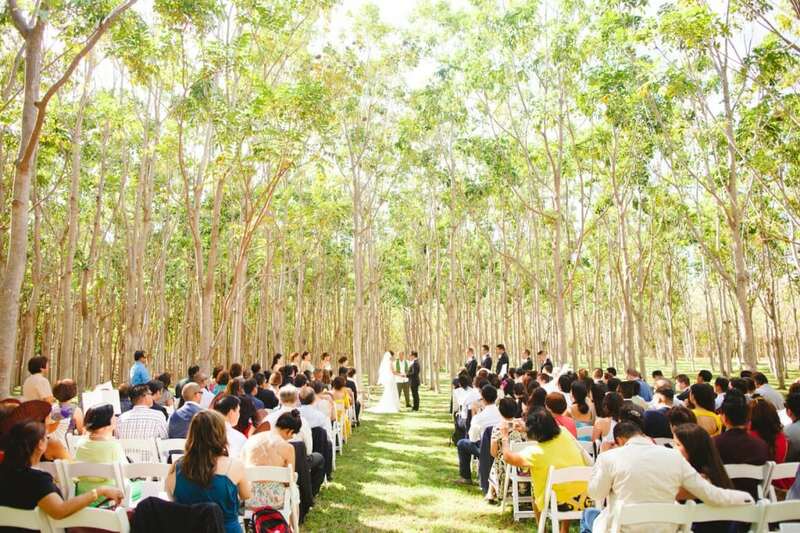 An absolutely stunning setting makes for a most memorable day. 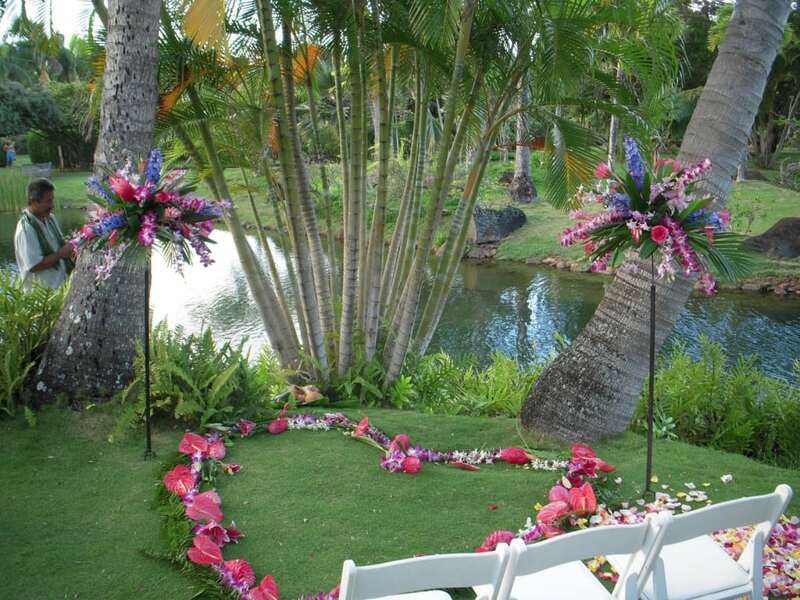 For an especially intimate ceremony, you may choose to cross the arched bridge to Hula Island, which boasts a panoramic view of Ka‘ula Lagoon where koi and native birds abound. 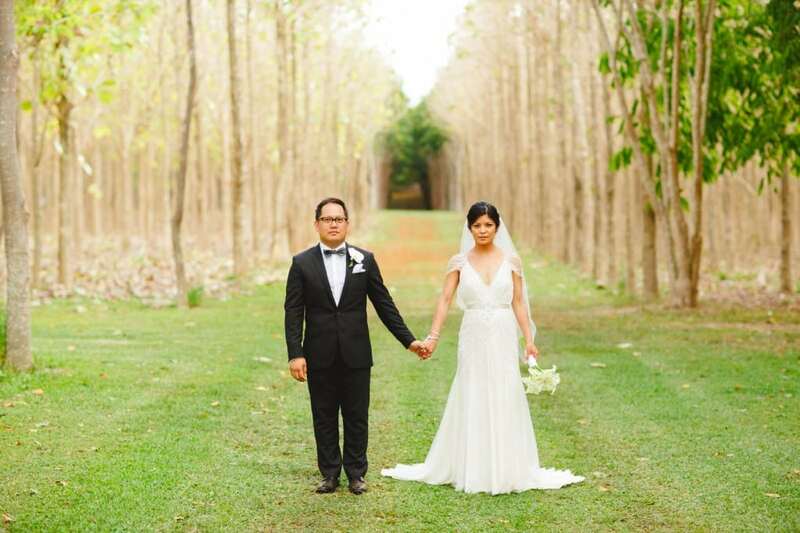 The Herb Garden is a serene and fragrant location for a ceremony and intimate reception where your guests can view the Poinciana Maze from a gazebo atop a scenic overlook. 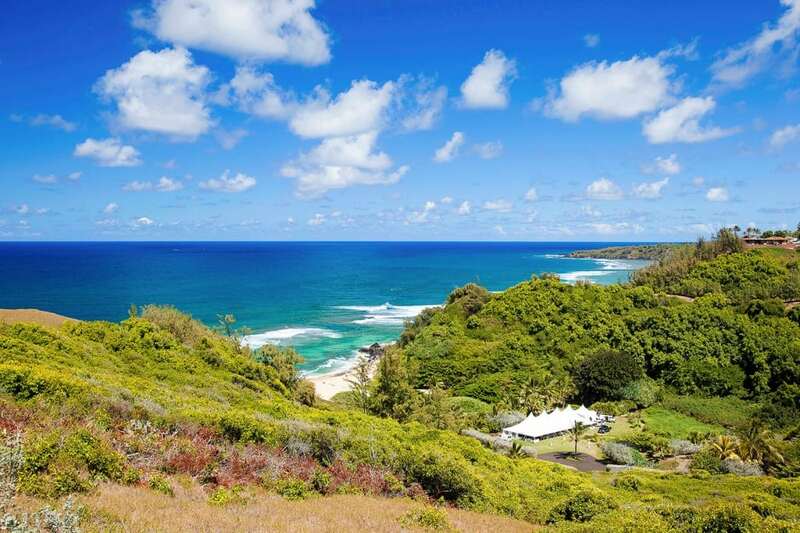 The former home of Na ‘Āina Kai founders Ed and Joyce Doty is an astonishingly beautiful and private venue overlooking Kahili Beach and a pristine wildlife preserve. 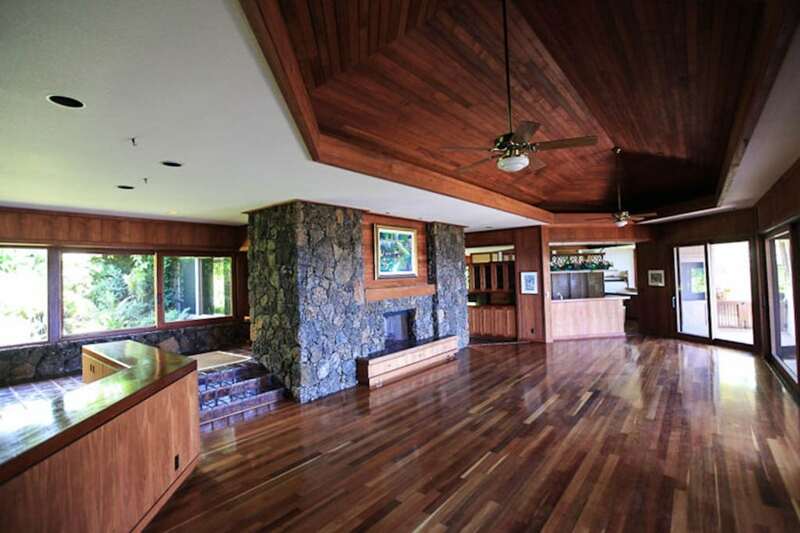 The home is elegantly appointed with a large living/dining room and ocean view lanai. 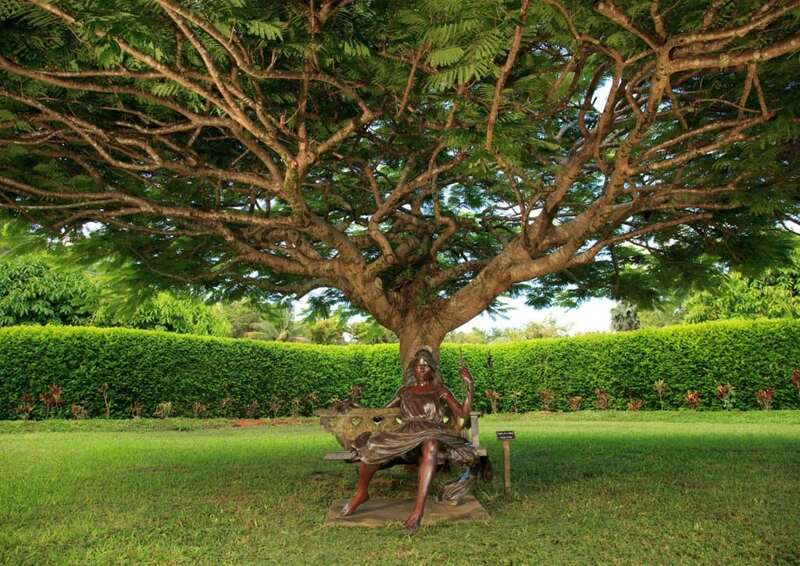 The Residence is graced with beautiful art and photography displaying the evolution of the Gardens. The Residence kitchen and pantry are a caterer’s dream for meal preparation and service. The front lawn and adjoining outdoor Herb Garden provide the perfect outdoor/indoor combination for your special occasion.